It’s quince time of year around these parts and due to a friend in the hills having some quince trees I found myself with a number of them so I thought I’d attempt to make quince paste. You eat it with soft cheese, like brie, and crackers and its sweetness complements the brie perfectly. I haven’t met anyone who doesn’t like it. 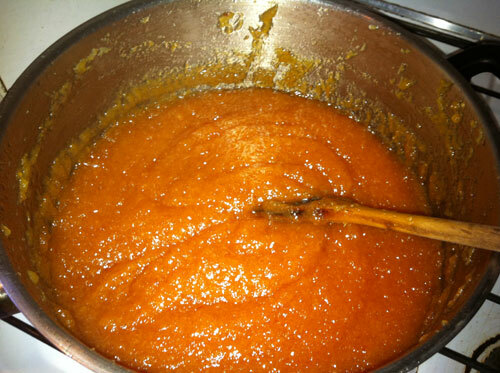 I found a quince paste recipe from the Australian Women’s Weekly and here’s what happened. I’ve italicised my notes below. Wash, peel and core quinces. Chop quince flesh coarsely and place in large saucepan. Tie peel and cores in a small piece of muslin to form a bag. (Only do this bit if you want to. I didn’t have enough room in the saucepan so I didn’t bother). Add to the quinces in the pan. 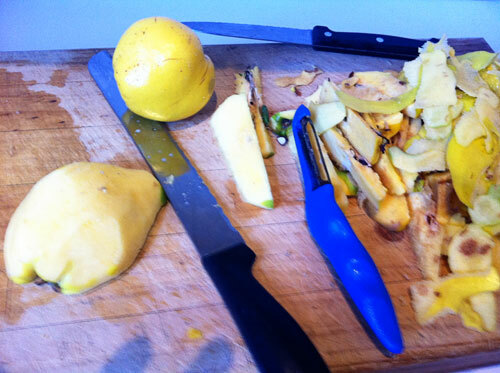 Add enough water to cover the quinces and boil, covered 30 minutes or until fruit is very soft. Remove muslin bag and push flesh through a fine sieve into a bowl. Alternatively you can process the fruit until very smooth (however, this method is only good if you have been very thorough in removing all skin, parts of the core and seeds from the quinces when preparing them.) Weigh the fruit pulp. You should have about 1.25kg of fruit pulp. Weigh out an equal amount of sugar. This is what the paste looks like when you first add the sugar to the pan. 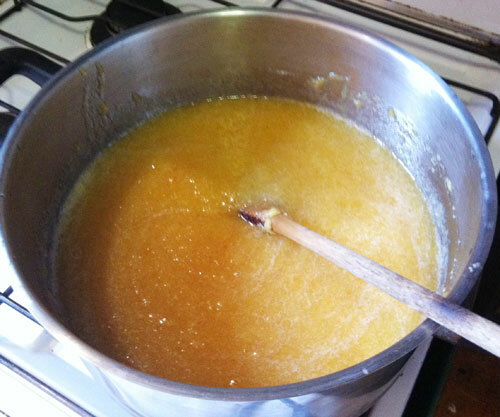 Combine sugar and fruit pulp in the same cleaned saucepan. Cook, stirring over a low heat until the sugar dissolves. Continue to cook, stirring every 5-10 minutes, until the quince paste is very thick and a deep ruby colour. At this stage a wooden spoon drawn through the paste will leave a very distinct trail across the bottom of the pan. This will take approx 1½ hours. This is what it looked like towards the end. I had to stir it fairly constantly so it didn’t burn to the bottom of the pan. Next time I will try it in the slow cooker as I think that will do a great job. Place in fan-forced oven with only the fan working (no temperature set) overnight or for several hours to dry out. Alternatively you can dry the paste in a very low oven (90°C) for several hours, or you could use a traditional method for drying the paste: in the sunshine if you have constant sunshine, in an airing cupboard, in a gas oven with the pilot light on, or as Stephanie Alexander mentions in her book – the cook’s companion, one of her reader’s wrote in to tell her she had successfully dried it on the back shelf of her car under the rear window! Whichever way you dry it, wrap it in baking paper and foil and then place in an airtight container. It should keep indefinitely. It’s a great accompaniment to cheese, or can be melted down and used in fruit tarts and pies. It should be cut into small wedges or squares to serve. I was very pleased with how it turned out and I have quite a bit to keep me going. Some of my friends tried it and we all loved it. The difference between this and the bought quince paste is how fruity it is. Even though it is a bit time consuming to make I thoroughly recommend giving it a go. It’s absolutely delicious. 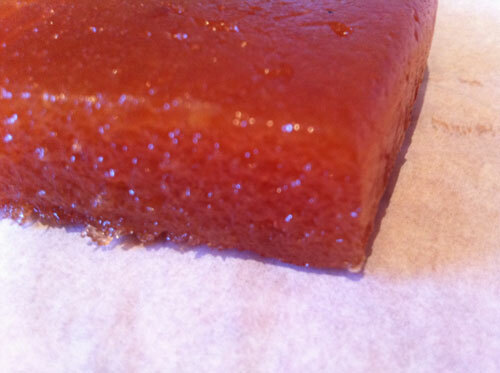 I adore quince paste. I remember when we were in Spain, our Spanish friends bought some and thought they were introducing us to something exotic. They were crestfallen to hear that we eat it all the time in Australia. I think they thought it was uniquely Spanish. Bless.